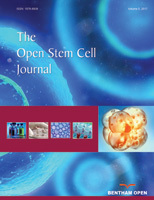 The Open Stem Cell Journal is an Open Access online journal, which publishes original full-length and brief research articles, topical reviews/mini-reviews, systematic reviews, and letters to Editor. Technical notes, preliminary results and case-series will be selectively evalued only if they will add results/concepts of particular interest to readers. TOSCJ considers guest-edited single-topic issues on all aspects of basic and clinical research on stem cells, embryonic stem cells, tissue engineering, biomaterials, developmental studies, genomics and translational research, ageing, epigenetics, cancer stem cells, cell therapy, in vivo imaging of regenerate tissues, stem-cell-based disease models, proteomics, metabolomics of stem cells and all the topics related to regenerative medicine. The Open Stem Cell Journal a peer-reviewed international journal, is among the most updated and reliable sources of state of the art and future insights on the TE&RM field. We highly welcome top-quality articles, articles accepted for review-stage by top-journals, articles reporting preliminary well-documented results: we will consider priority for publication the previously listed article types.